I made my first quilt in 1985 while I was pregnant with my oldest child and working on my Ph.D. in chemistry. I called it my dissertation quilt because I figured that under the circumstances it would take me as long to finish as my dissertation, and it did. Children, careers, and other interests took up my time, and my sewing was restricted to Halloween costumes, smocked dresses, and counted cross stitch. Then, in 2007, I picked up a novel in the South Chatham library that revived my interest in quilting, and found a book at Tumbleweeds with the pattern for the quilt in the book, “The Quilter’s Apprentice.” Since then I have made over 100 quilts, attended many classes and workshops, and am a member of two guilds (one in Florida, where I spend the winter, and one on the cape) and a sewing circle. For years, people have asked me if I would make custom quilts and I have only been willing to do it on rare occasions, but now I am ready! I also love to bind quilts by hand, which is a task that many quilters hate. 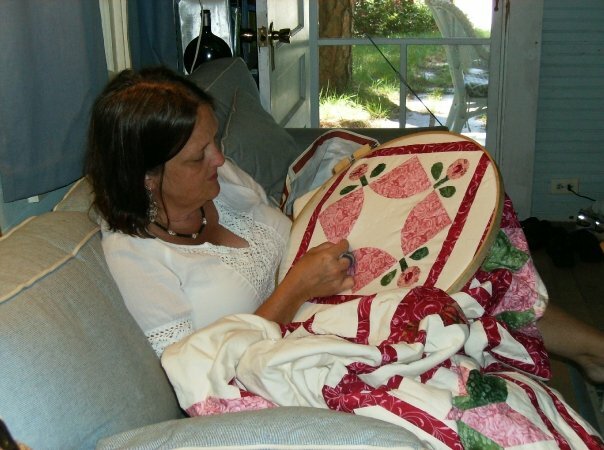 I have known people who get to the stage of binding and set the quilt aside for years, so I would be happy to help you finish that quilt that has been waiting for binding.